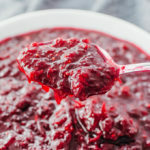 An easy recipe for making homemade cranberry sauce with orange zest in the Instant Pot pressure cooker. Add cranberries and water to the pressure cooker pot. Cover and seal the lid. Cook at high pressure for 1 minute, followed by natural release. Uncover and turn on the saute mode for medium heat. Add sweetener, fresh orange zest, and salt, stirring together. As the sauce begins to simmer, use a stiff utensil to break apart the cranberries and stir nearly constantly, for a few minutes or until the cranberries are burst. The sauce should thicken quickly; if not, let it simmer longer until it reaches your desired consistency. Turn off the saute mode, and stir to cool down the sauce until it stops simmering. Serve while hot. This recipe yields 4.5 g net carbs per serving (1/4 cup or 1/6th of the recipe).